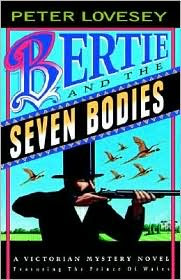 The third body has just been set off to one side in Peter Lovesey's Bertie and the Seven Bodies, which means I have about half the book to go. But I can't resist passing on a delicious passage. "Well, you'll have gathered the direction my thoughts were taking. It seemed to me that the victims had been picked off like prey, impersonally, for no other reason than that they happened to be guests at Desborough Hall at this time. Such callous slaughter is not unknown. I can't expect my twentieth-century reader to have heard of the East End murders committed in 1888 by a seeker of publicity known to the press as Jack the Ripper. At the time they made a considerable sensation. He wrote letters challenging the police to catch him, but up to now he is still at liberty. I tell you candidly, sitting in that darkened room, I could foresee a campaign just as brutal and alarming as the Ripper's – in fact more alarming, because it was aimed not at streetwalkers, but people of refinement." This passage contains much to enjoy, laugh at and think about. You and Martin Edwards both appear to be having a Peter Lovesey "wallow" this week. Have you ever read WOBBLE TO DEATH? It is one book I really remember reading and I think it showed me that there was more to crime fiction than the Golden Age writers who had determined my diet until then. I list Peter Lovesey among my favourite writers although I don't actually think I've read all he's ever written. Thanks. I'll wallow in a bit of Peter Lovesey myself. I had previously read a few of the Peter Diamond books as well "The Detective Wore Silk Drawers." I think "The Last Detective" is one of the best disgruntled-cop-who-can't-get-along-with-his-colleagues books ever. I can see I'm going to have to track down a copy of this book, it sounds wonderful. I've enjoyed the discussion about nostalgia novels. In this day of political correctness gone mad it's always refreshing to read something that's not, or that reflects unashamedly the social mores of that time. I wonder how many writers self-censor least they (shock horror) offend people? Also, isn't it annoying when writers place modern day social mores upon historic times. Surely it's better to reproduce the social climate of that time and credit the reader with the intelligence to think about how things have changed. I'm glad you brought that up. It's easy to be politically correct and equally to easy to react in the opposite way. To strike a balance the way Lovesey does is probably far more difficult. I write about historical crime fiction from time to time, and the question in the background is always how to strike a balance between appealing to contemporary readers on the one hand and presenting a believable portrait of the time in which the story is set on the other. Lovesey does that as well as anyone I can think of. That's a delightful passage in what sounds like a delightful book. Thanks for the tip. I could use a bit more humor in my reading. I hope to have a copy in hand when I wing my way East to Philly. Peter Lovesey has got to be one of the most capable and versatile crime writers of the last forty years. If you don't find a copy for your flight to Philly, perhaps you could find one for the flight back. I bought my copy new in one of the large bookstores. Kerrie, I realize I failed to answer your question. I have not read Wobble to Death, though I have long loved the title. That was Peter Lovesey's first novel, wasn't it?